Description: Perennial herb with slender rhizomes; stems erect, growing in clumps, but not densely matted, 9-18 cm tall, glabrous; leaves opposite, sessile, linear to linear-lanceolate, 27-35 mm long, ciliate at base; flowers solitary in upper leaf axils; peduncles 18-32 mm long; sepals not connate, green, glabrous, ovate-lanceolate, 4-6 mm long; petals 5, deeply bilobed, white, exceeding the calyx; styles 3; capsules oblong, black, 6-8 mm long; seeds dark brown, 0.8-1.0 mm in diameter. Flowers July and August. Similar Species: Stellaria porsildii differs from other taxa within the S. longipes Complex in having clumps of erect stems that are uniformly scattered and not mat-forming, solitary flowers in the axils of normal-sized leaves, and fertile stem leaves greater than 27 mm long. Pseudostellaria jamesiana is easily distiguished by its conspicuously glandular inflorescence. Distribution: New Mexico, Grant County, Pinos Altos Mountains; Arizona, Cochise County, Chiricahua Mountains. Habitat: In shade and partially open understory of mixed conifer and aspen forests, and occasionally scattered on roadsides with steep, loamy and rocky embankments; 2,400-2,500 m (7,900-8,200 ft). Remarks: The specific epithet honors A.E. Porsild for his knowledge of the Stellaria longipes Complex. Conservation Considerations: Additional field surveys are needed to document the distribution, abundance and habitat requirements of Stellaria porsildii. The effects of forest fires and livestock grazing on this shade-loving species have not been studied. *Chinnappa, C.C. 1992. 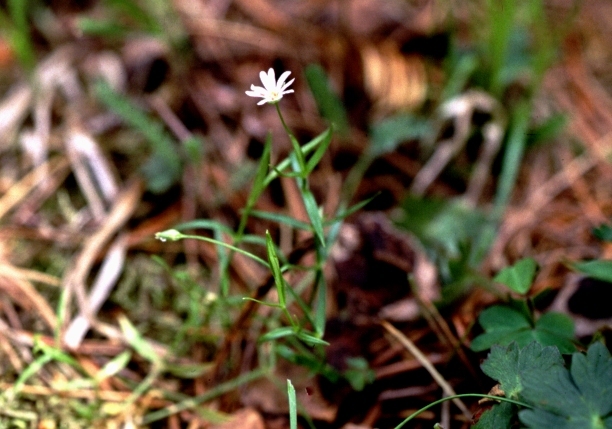 Stellaria porsildii, sp. nov., a new member of the S. longipes complex (Caryophyllaceae). Systematic Botany 17:29-32.